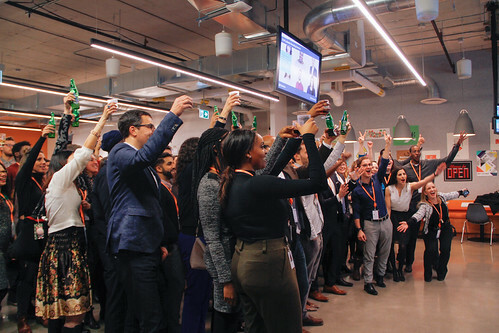 On January 26th, the ELN gathered at Facebook Canada’s new office to celebrate the network’s accomplishments in 2016 (including its 10 year anniversary!) and to ring in the new year! ELNers had the opportunity to connect and reconnect with members of the network while enjoying some refreshments, great music and great company. Check out pictures from the ELNsnowcial here , and see a recap of the event from Matt McNama, 2016 Events and Programming Lead on our ELN executive team – we can’t wait to see you all at the next event! On a rainy January night, the Emerging Leaders Network hosted a winter social—a Snowcial to be exact. Despite the weather not quite living up to our event name, the ELN came together to kick off the 2017 event program in style. Our friends at Facebook and Instagram Canada were gracious hosts for the night, which brought out more than 100 ELNers. Fellow ELN executive member Lana Majid and myself served as MCs for the evening, ushering the event along. Here’s the thing about being an MC—it always seems like a good idea when you volunteer…maybe not so much right before you turn the mic on, however. Butterflies aside, it’s always a pleasure getting to connect in spaces, especially like Facebook and Instagram, which was incredible! Just about everything you would expect from the Canadian HQ of one of the biggest tech companies in the world! The office was like a tech oasis inside the MaRs building—a fully stocked kitchen with every snack and caffeinated beverage imaginable, art installations, and of course a giant Instagram logo begging to be part of a selfie. Hosting us from Facebook and Instagram was Jake Norman, Head of Agency Development. Jake welcomed us to the space and filled us in on some of the innovative work the company’s been doing. A big thanks to him and Facebook and Instagram for letting us use the space. The night was a stellar start to 2017 ELN event program. What’s nice about the social events is that we maximize our time to get to know fellow ELNers. New folks mixed with returning members as consumed delicious eats and drinks. I had the chance to meet a bunch of first time attendees and volunteers that made the night such a success. Thanks to all of those who came out. And for those who couldn’t make it, check out the pics on Insta under #Snowcial.